You might have seen Fred Compagnon before, he’s a French surfer/bodyboarder/experimenter who often crops up with unexpected, ingenious ideas, like a detachable nose section for riding drop knee on a bodyboard or strapping himself into an alaia and jumping off an SUP for a one man tow-in. 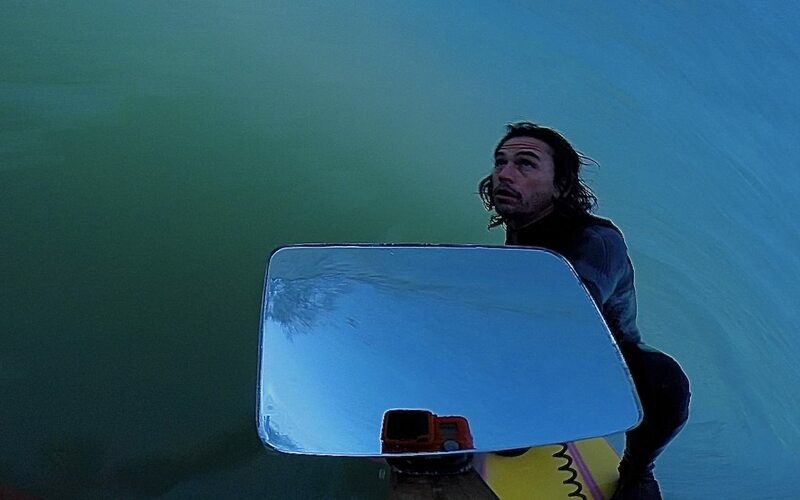 This time he’s uploaded a frame grab from a GoPro where he’s holding a mirror so you can see him in the tube and the reflected view of the lip pitching down the line at the same time. I’m not sure if it’s practical to surf with this set-up, unless you’re as skilled as Fred Compagnon, but I might give it a go if I get a chance some time, I can see it being very useful when filming myself shooting stills. I think it would work better with a convex mirror, if I can find a cheap one on line I think I’ll start experimenting.